The philosophy at Kaufman Dentistry is simple: to provide each and every patient with comfortable, low-stress dental treatment that improves the health and appearance of his or her teeth. Led by the father-son duo of Drs. Warren and Matt Kaufman, our team takes pride in our work, and we do everything that we can to ensure that our patients are happy with their care and satisfied with their end results. 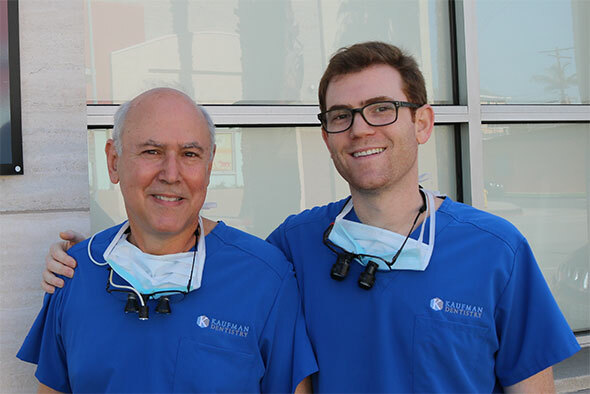 The pairing of Dr. Warren Kaufman and his son, Dr. Matt Kaufman, gives our practice unique strengths. Dr. Warren is an experienced dentist with more than 30 years in practice. Though newer to the field, Dr. Matt embraces new technology and techniques to give long lasting restorations with the easiest patient experience possible. Kaufman Dentistry prides itself on understanding and using the latest techniques and technology in dentistry. We wholeheartedly believe that with our new technology, our patients get the best possible experience in the safest environment while leaving with the best dentistry available today. At 28 I finally got my first filling(s). I was nervous, of course, but they were very professional and very kind. I appreciate how their office is open and techy. Every time I visit I feel like I’m in the presence of dentists and hygienists that know what they’re doing and, just as importantly, want to take care of me. I definitely recommend this dentist office for someone looking for a place to go, even for the first time. I have been a patient at Kaufman Dentistry for many years. Recently I moved from Culver City to Thousand Oaks. I found a new dentist closer to my new house. However, I just didn’t feel “right” about the new dentist. My instincts guided me back to Dr. Kaufman. I drove an hour to get a consultation and discuss my future dental work. I know that Dr. Matt and his fantastic staff will take the best care of me. The dental care I receive is gentle, thorough and very state-of-the-art. Everyone at Kaufman is kind, caring, friendly and very professional. I am very thankful. I’ve been to many dentists. Some tell you to get certain treatments for no reason and others don’t know what they are doing. It took awhile to find Dr. Kaufman. Ive only seen Dr. Sr and prefer it that way. He has a conservative approach and explains things in detail. Doesn’t recommend things that you really don’t need. He hums a tune while prepping for procedures. I’m sure that’s his way to cope with stress which I know dentistry is one of the highest stressful jobs. Love Laurie. She’s been there for a long time. Totally recommend them. They are truly a diamond in the sea of dentists in Los Angeles which there r so so so many bad ones. Kaufman Dentistry should receive more than 5 stars. The customer service and knowledge that was given to me when I came in for a tooth ache. The quality of service I received is beyond what I am able to explain in words. Honesty is very important and hard to find these days and Dr. Kaufman was honest and straight forward with everything. He explained what was wrong with my teeth and what needed to be done. I’ve been to other dentists who charge an arm and a leg when there isn’t anything wrong. Dr. Kaufman was precise and proficient. I have always found that Dr. Kaufman and his staff are always friendly and professional. If I ever have to cancel an appointment they try very hard to get me in as soon as there is an opening. All of the work done has been quality work and all of the professional care advice they have given me has worked. They care about the overall health of their patients which makes me feel like nothing is overlooked. They explain everything clearly before they do anything and listen to any questions I might have. I know if I have an emergency, I can count on them to make time to see me and take care of it. The folks at Kaufman Dentistry are knowledgeable, courteous, caring and have great dispositions. You cannot ask for more! In addition, they always have the latest technology to aid them and to make your experience and need as professional and painless as possible. My hygienist, Gabrielle, did an amazing job cleaning my teeth. She really took the time to scrape and get the grime off compared to other places that just apply some polish on your teeth and send you on your merry way. When I looked at my teeth at home they visibly looked cleaner and whiter. They felt cleaner, as well. Dr. Matt was great, as was the X-Ray tech (sorry, didn’t catch her name). It’s refreshing to see digital x-rays in this day and age. Glad they keep up with technology. Such a pleasure to visit this office. Everyone here is extremely professional and courteous. I’ve been going to Kaufman Dentistry now for a while and the staff as well as both Dr. Kaufmans are very warm and welcoming. Its a small practice and they remember who I am each time I go, which is more than i can say for other practices I’ve been a patient at. I feel totally comfortable with the procedures and they are very open to explaining how and why they suggest certain options. Overall I’ve had a wonderful experience and am looking forward to my next visit. I’ve been a patient at Kaufman Dentistry for many years – first seeing Dr. Warren, then Dr. Matt, after he came aboard. Both father and son have been consistently attentive to my needs, patient with my questions, and thorough in explaining the hows and whys of needed or proposed procedures. Maria, at the front desk, is friendly, welcoming and always helpful – especially with insurance/financial questions. Lori and Gabrielle are equally wonderful members of this “family!” I love my chats with Gabrielle, somehow possible even while she’s cleaning my teeth! And Lori is always there for cheerful, gentle chairside assistance when needed. How nice it is to always feel so welcomed and cared-for in my dentist’s office! I’ve been going here for almost 4 year now. Gabriella is the best hygienist I’ve ever had. Dr. Warren Kaufman and Dr. Matt Kaufman are extremely good at their jobs. They are informative without being pushy, and offer many great services. Also, they’re both just really nice people. I have been a patient of Dr Warren for 25 plus years and find that he and his whole staff are above all the rest including his new partner/son Dr Mat. Dr Warren always try to make sure that the treatment and care that I receive is done in a professional, clean and safe environment and that I leave happy. It’s not often that I give reviews or feel at ease with doctors who I receive treatment from but in Dr Warren’s care I feel very comfortable in referring him to my family members and friends in which I have. Gabriel, both Dentists and all the staff are wonderful. You know you are in the best of hands when you go to them. I would never think of going anywhere else! I feel so fortunate to have found Kaufman Denistry. Thank you so much. The staff is excellent. They have good humor and are very professional. The facility is clean and well lit. They don’t push unnecessary treatments. I’m a big fan of this dentistry and everyone who works there. I just love this father and son team I have been going to this dentist for over 20 years and I have never had a bad experience. As always, my experience at Kaufman Dentistry is both professional & friendly. The staff are both knowledgeable & experienced to make the visit efficient & pretty much painless. I have been coming here for about 25 years & will continue to do so even though I drive in from The San Fernando Valley. Dr. Matt Kaufman is a thorough and skilled dentist, He takes time to sit down and explain each procedure and answer any questions or concerns. Loved that he didn’t try to over prescribe work . I went in for an issue I was having. Both doctors gave me a long consultation and decided long term it was best for me to go to a specialist for my needs. They could have given me what I came for but they did the right thing for me. That kind of service is rare these days. And they didn’t charge me a penny. Even put quarters in the meter for me! I was impressed with my first visit at Dr. Kaufman. The cleanliness of the office, the friendliness of the staff along with their professionalism was excellent. The Hygienist did a great job with the teeth cleaning and also was very personable and interacted with me and bottom line….I loove Dr. Matt. Look forward to seeing you all in 6 months. Thank you. This place is very well kept. The front desk is helpful friendly (hard to find at a dental office) and organized. The equipment they used seems to be very modern. Both the father and son that are dentists are informative and friendly. Don’t love Dentists, but this place turned me around. There is a strong sense of family business ethics and a genuine kindness towards people. I am seriously impressed with the high level of concern, care, and skill at Kaufman dentistry. And let me add, I am very very impressed with their support staff, and office staff. Even the little things are done well and thoroughly.